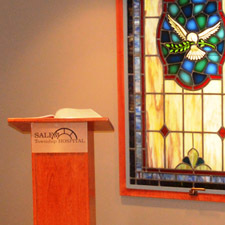 Family members and friends are welcome to visit their loved ones during their stay at Salem Township Hospital. Children must be accompanied by an adult at all times. Public restrooms and drinking fountains are located near the elevator in the main lobby. Enjoy Starbucks coffee at the Bistro, located in the main lobby. We offer free wireless internet for your convenience. Smoking is not allowed on hospital property. Please refrain from visiting if you have cold or flu symptoms. Our cafeteria and bistro serve healthy and delicious menu items. 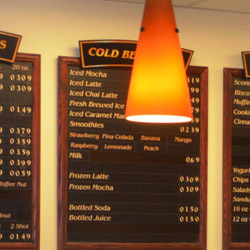 Visit us to enjoy hot meals, a salad bar, pizza, soups & sandwiches and a wide variety of beverages including Starbucks® coffee and espresso. The Pink Petal Gift Shop is open in the main front lobby with a nice selection of gifts, flowers, and snacks. Our Chapel is located by the large pillar in the front lobby and is available to you. The Auxiliary played a large role in furnishing the chapel. It also features a large stained-glass window.